For family caregivers, the holidays can be a joyful time when spirits are lighter and it feels good to care for loved ones and enjoy time together, celebrating with family traditions. But for most family caregivers, the holidays also bring stress, according to Amy Goyer, a family and caregiver expert at AARP, the nation’s largest nonprofit, nonpartisan organization dedicated to empowering people 50 and older to choose how they live as they age. “We’re already very busy with caregiving, and there’s even more to do during the holidays,” Goyer said. A major concern is for those caring for sufferers of dementia. A new AARP poll on dementia care has taken a closer look at the experiences of caregivers for family members with dementia and found more than half say their social life has suffered and nearly 45 percent say they feel alone. In addition, they are more likely to grow further apart from the ones they care for and other family members because of their caregiving responsibilities. Social isolation and loneliness are linked to poorer physical and mental health outcomes, health experts said. “Family caregivers take on big responsibilities that can be physically, emotionally and financially challenging. AARP’s new research shows that this can be particularly true for those caring for loved ones with dementia,” said Nancy LeaMond, AARP Chief Advocacy and Engagement Officer. Not only are the millions of family caregivers for those with dementia less socially connected, they are significantly more likely to put off medical care – over half (55 percent) have done so, compared to just 38 percent among the total caregiver population. However, there were positive health behaviors identified in the poll as well – 79 percent took steps to maintain or improve their brain health and 47 percent exercised more. Still, when caring for those living with dementia, everyday stress is even higher, and holiday celebrations may be limited, Goyer said. “Caregivers may feel particularly isolated or lonely – especially if their loved ones aren’t able to understand or take part in holiday traditions and if caregivers are unable to get out to be with friends or other family members,” she said. Many family caregivers feel alone in their situation, but there are others who understand as they are going through similar experiences, Goyer said. “I recommend connecting with other caregivers in an in-person support group, at a caregiving event, or online. 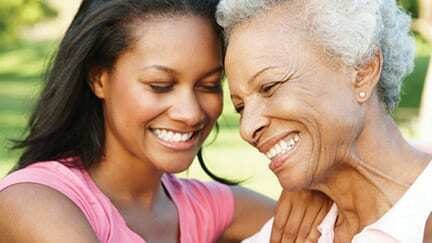 The Alzheimer’s Association offers support for dementia caregivers, and AARP has teamed with them to offer the online Community Resource Finder, where caregivers can find local events and support groups,” she said. AARP also offers a free online Caregiving Community where caregivers can post questions, comments and topics as well as get advice from Goyer and other caregiving experts. Many caregivers also join closed social media groups, such as Facebook. Other family members, friends or neighbors can help as well. A previous AARP poll found that almost 8 in 10 family caregivers say it would be helpful to have someone to talk with during the holidays. “If you are long-distance, you can call those you know who are caring for someone and really take the time to listen to them,” Goyer said. Also, on the AARP Family Caregiving Site, Goyer also offers these 10 Tips for Caregivers During the Holidays: Feeling Stressed? Reset your Expectations. Meanwhile caregivers should be mindful of such things as prolonged social isolation and feelings of loneliness which have serious health effects that make it important to monitor and take care of themselves before they suffer a health crisis, Goyer said. “It can be difficult to evaluate the stress levels and vulnerability of ourselves or another person. Isolation and stress can build up over time, so it’s important to make ongoing effort to prevent burnout,” she said. The AARP Foundation has an assessment tool at Connect2Affect.org to help people better understand the signs of social isolation and offers solutions and ways to help others who are isolated. “I advise people to watch for signs of burnout, like being short-tempered, changes in sleep patterns – sleeping too much or too little or waking up a lot, for example – crying a lot, severe mental, emotional or physical exhaustion, prolonged overwhelming sadness, loss of motivation – just not caring anymore, feeling hopeless and ineffective, letting paperwork pile up and bills go unpaid, allowing a vast change in our living environment or longing to run away,” Goyer said. “These are red flags that tell us it’s time to put more effort into taking care of ourselves. For the holidays, Goyer said caregivers should try to focus on the simple things like holiday music, movies, stories or food. “Above all, fully experience the most meaningful things during the holidays and enjoy those treasured moments with your loved ones,” she said.